Food Events Around London: Tea Parties, Pizza Parties and…Wine Parties? I love parties. I’m in the process of planning a big family joint birthday party for my mom, sister and dad that may or may not involve an entire roast pig. Who doesn’t love a good party? Obviously, the best parties include copious amounts of food and alcohol. At many London parties and events of the last month or so, my alcohol consumption has drastically outweighed the food consumption. Often, my memories of the event can get a bit fuzzy. Luckily, I took pictures. Here’s a photo from the Bibendum wine event at the stunning Saatchi Gallery. Can you spot the foodrambler? The room was carpeted in real grass (hand laid by our dedicated friend Lizzie!) and populated by a small community of garden gnomes, one of whom came home with me at the end of the night. Chris and I named him Chomsky. We’re nerds. The Yelp party also featured a real tube-car-as-a-bar slinging free cocktails and bunch of market-style food stalls, including fantabulous frozen yogurt, a sort of bizarre spiralled potato chip on a stick, and my most favoritest roast hog people. Last up, I got a chance to taste the new Pizza Express menu by Francesco Mazzei, the chef from an award-winning London restaurant called L’Anima that I’m hoping to go to someday. Shockingly, I’d never had Pizza Express before – it’s a very popular chain in the UK – but I was quite impressed with what I tasted of the new dishes. I liked the spicy Calabrese pizza the best – a thin and crispy crust, fior di latte mozzarella, watercress in basil pesto, a few more chilies and peppers, and most importantly, nduja sausage. Anything with nduja on it is a friend of mine. Mmmm…looking at pictures never fails to make me hungry. I’ll take a spicy pizza, a few Millionaire’s Squares, a bottle of that rich and chocolatey Malbec, and a teacup of G&T. It’s 2am. Bibendum, Yelp and Pizza Express, do you deliver? Thursday’s Rambling Restaurant was a boozy festival of wine tasting and matching canapes – so many glasses of alcohol that I’m amazed I could stand up straight long enough to take any of these photos. We partnered with the lovely and charming Dan of Bibendum Wines to do a casual and relaxed evening event in our usual secret location. 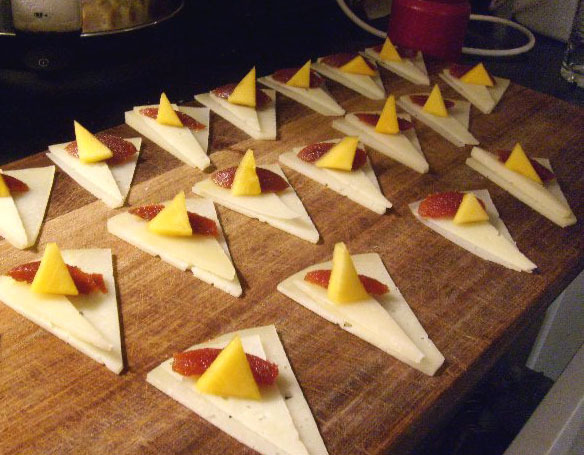 Dan ‘liberated’ a serious stock of bottles from the Bibendum stores for us – Champagne, Riesling, Chardonnay, Malbec, Chianti, and an excellent dessert wine – all matched with bite-size hor d’oeuvres such as the Zamorano cheese with quince jelly and persimmon, above. 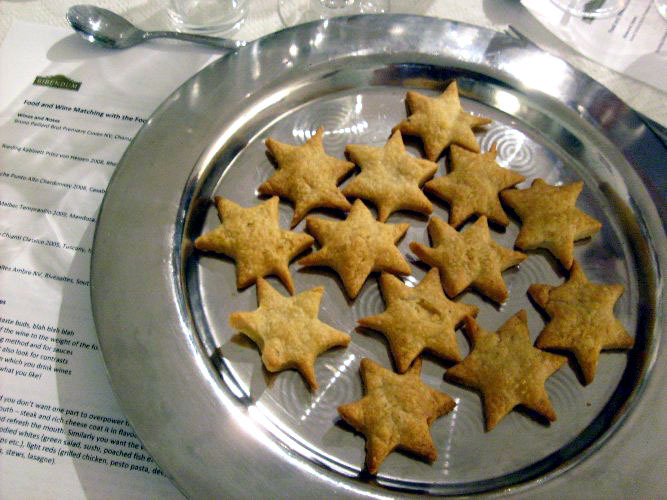 Below, tasting notes with parmesan crisps awaiting their toppings for the first round of canapes.